I used to think radiators were crappy, unsightly relics of Victorian era plumbing that had to be hidden away at all costs. If I'd known they made them this cool (er, hot) looking, I wouldn't have been so quick to buy a house with central air. Seriously, these things are outrageous, and Bisque carries way more than I have pictured here. And, yes, by "radiator" I do mean those things that heat your house. 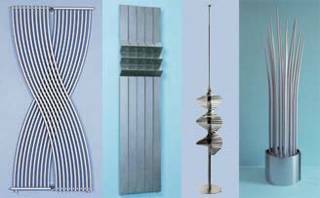 You may be confused looking at the pictures, wondering if I meant to say "metal sculptures" instead of "radiators." I had a look at some of these at the Interbuild exhibition this year - interesting stuff, but be careful if you have kids. Lots of sticky out bits at the perfect height to crack your head on, and plenty of cavities to push bananas into. Although if you're in the right marketing bracket for one of these, you probably live in tiny inner city 'loft' and don't enough volume for children. that plant ciould put an eye out. Imagine tripping and falling on it. It looks like it could do quite a bit more than just gouge an eye out. Yeah. 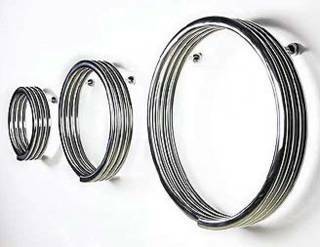 I've just bought a bisque radiator. It's fantastic! It probally wouldnt cost hardly a thing to make with copper tubeing and silver spray paint. i grew up with a woodburning cast iron stove and cast iron pots and frypans. food does taste completely differant than when cooked in regular pots. hey guess what, I work there! well, one of the showrooms at least. and to clear some things up, unless you're a seven-foot giant, there is no way your eye is going to reach the spikes on the Power Plant. And spraying copper tubing with silver paint would just leave you with something that didn't radiate heat properly and had streaky melted paint all over it. We import from manufacturers in Italy and Switzerland for the most part, and they are *rigorous* when it comes to product quality, especially the Swiss. So the radiators are good, honest. I have not seen radiators like these before and as wonderful and artistic as they are, how effective are they at actually doing what they are supposed to do. I.e. heat your property?